The Arris LED bath light from Tech Lighting is a modern take on the classic three-, four-, and five-light vanity light fixtures. Featuring a handsome full-length backplate in your choice of high quality metallic finishes, its crisp metal details complement its frosted rectangular molded glass shades for a tailored, sophisticated look which fits design aesthetics ranging from clean contemporary to warm contemporary. 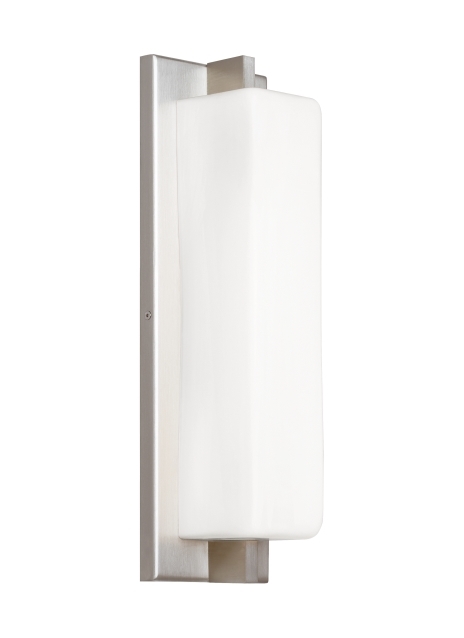 In addition to each Arris bath light fixture being able to be mounted horizontally above a mirror, they also can be mounted vertically flanking a mirror or as a wall sconce light and are fully dimmable for creating the desired ambiance. Includes 25 watt, 860 delivered lumen, 2700K LED module. Mounts horizontally or vertically. ADA compliant. Dimmable with low-voltage electronic dimmer. Length -- Choose -- 15"